Wat Prayoon or officially Wat Prayurawongsawat Worawihan sits on the Thonburi side of the Chao Phraya river at the foot of Memorial Bridge. 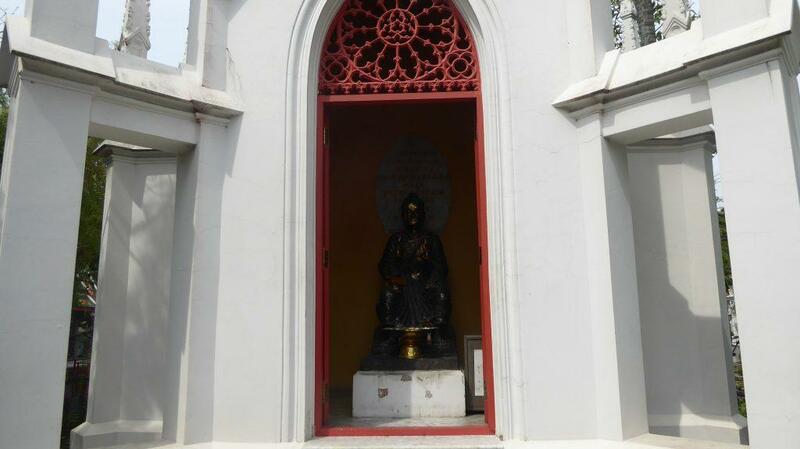 It was built during the reign of King Rama III on an old coffee plantation. It was originally called Wat Rualek inspired by the Iron fence that surrounded it which was made from axes, swords, and lances. A small section of the fence remains. 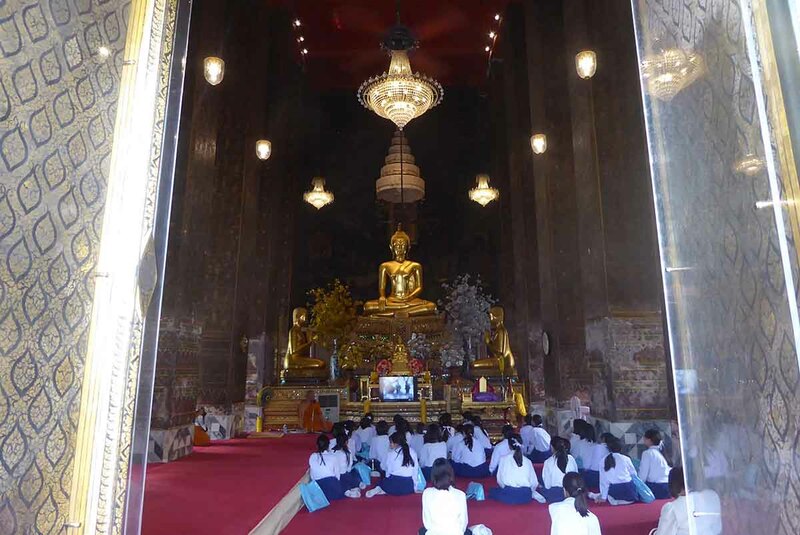 In 2013 the temple won an award from UNESCO for its conservation project. 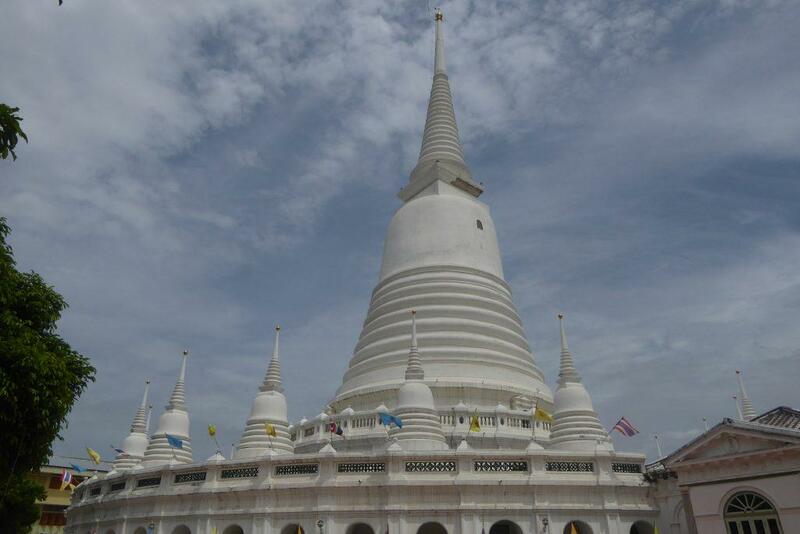 Wat Prayoon features a unique large white bell-shaped Lanka style chedi which contains relics of the Buddha. 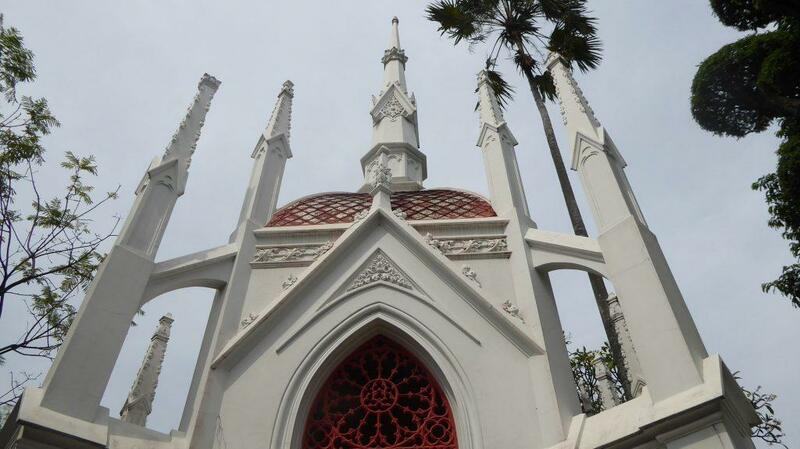 It was the first temple of the Rattanakosin period to feature a Lanka style chedi. There are 18 smaller chedis spread around the base. 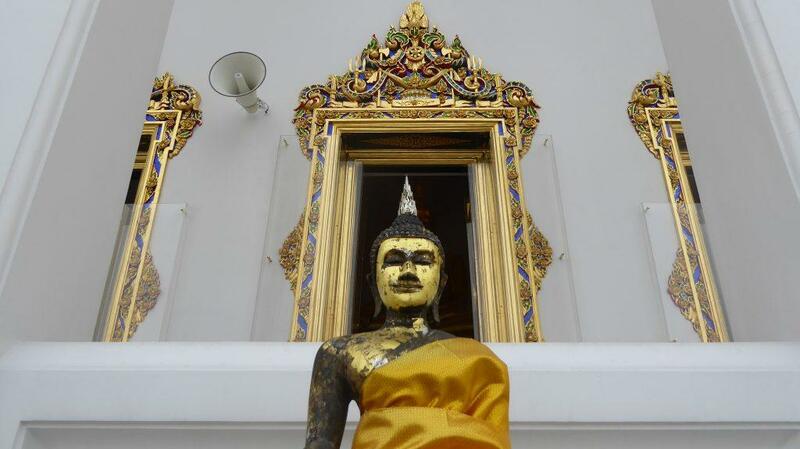 You can access the upper terrace of the chedi by a narrow stairway accessible via the museum. There are good views of the local area from the terrace. 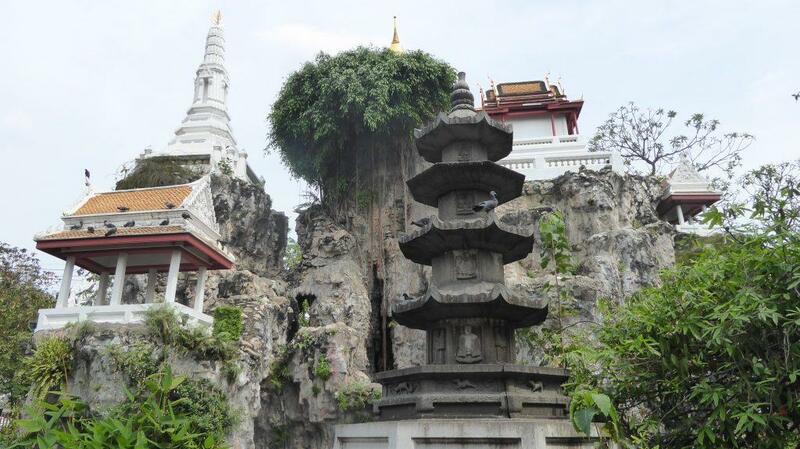 There is a small entrance to the inside of the pagoda on the inner terrace wall. To the left of the chedi, you will see the famous red iron fence, a gate through which leads to the temples Vihara and Ordination Hall which stand side by side. 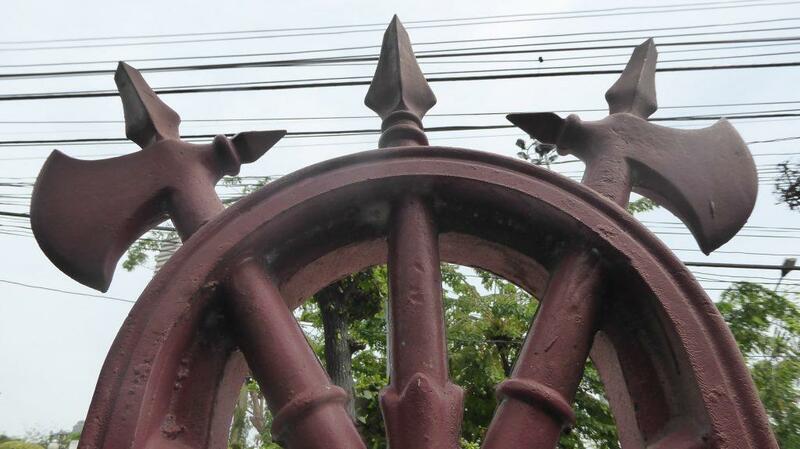 The iron fence was made in England and was gifted to the temple by King Rama III. 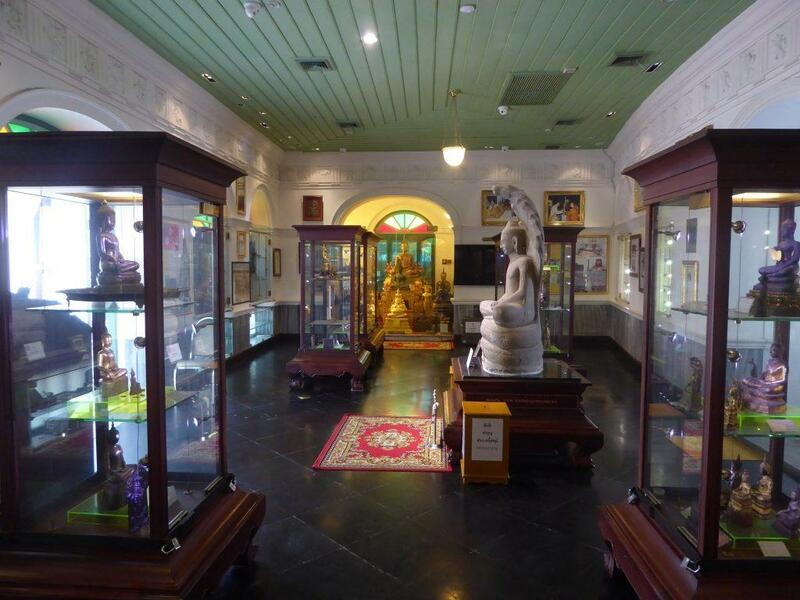 Next to the base is a Buddha images museum that features many images, amulets and other artifacts that were discovered inside the base of the chedi during renovation works in 2006. In all over 270 images were found along with thousands of amulets. You can see some of the discoveries displayed in the museum. 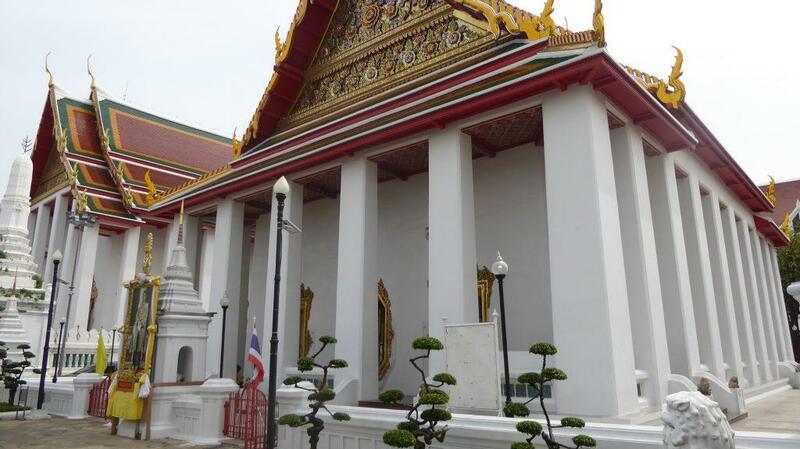 The temples Ordination Hall is to the right if looking from the Buddha Images Museum. 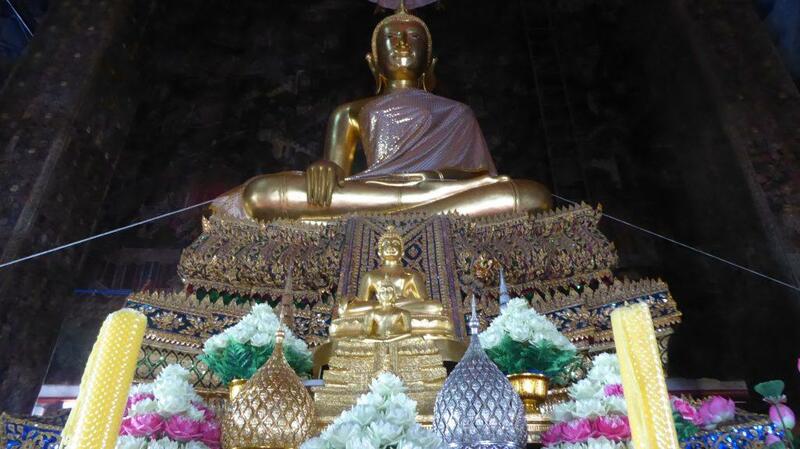 The Buddha image inside is Phra Buddha Vishnu Prophet in the posture of suppressing Mara (conquering evil). The image is made of metal and gilded with gold plate by artisans from Japan. 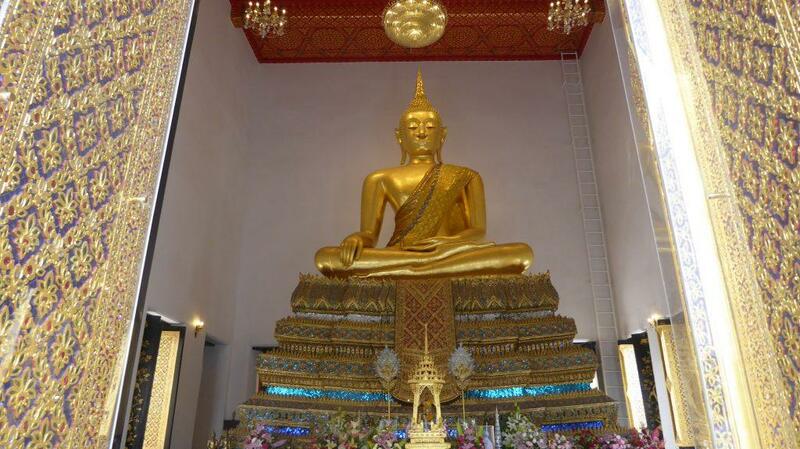 It was installed in the temple in 1828, the same year the temple was built.The murals behind the image portray scenes from the life of the Buddha while on the surrounding walls are scenes from the Jataka. 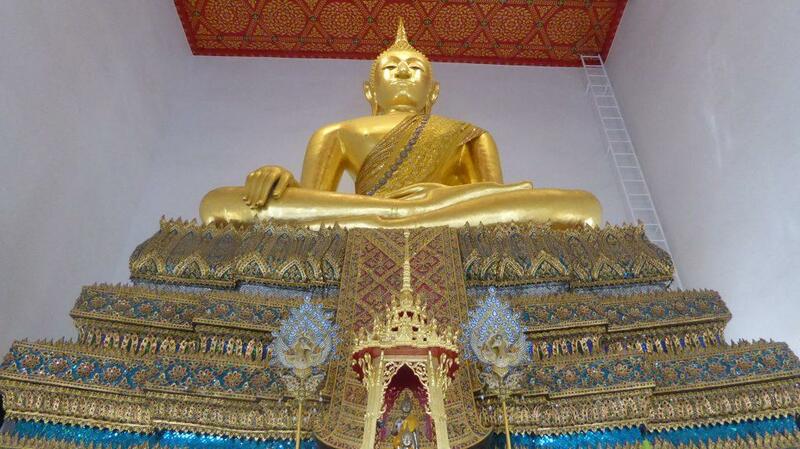 The Vihara next door contains another large image, Phra Phuttathama Wichettha Satsada. 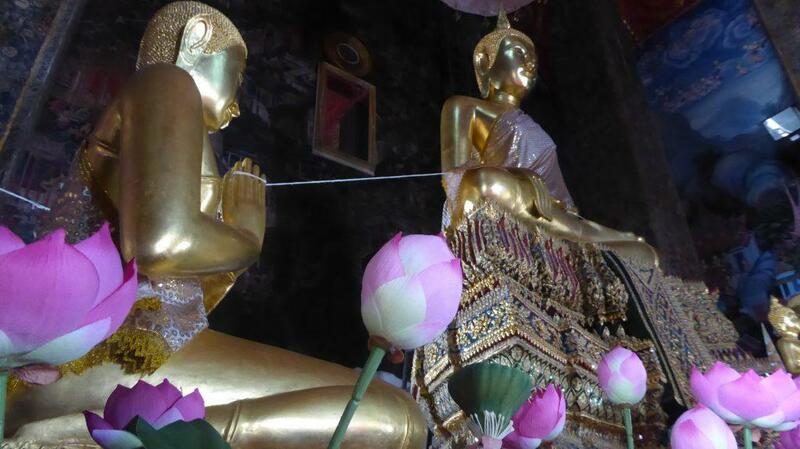 The Buddhas name was bestowed by King Rama IX at a ceremony at the temple in 1992. 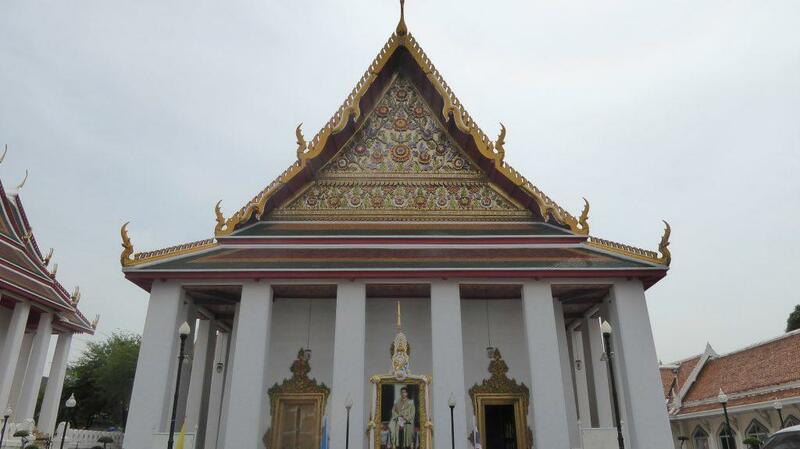 Wat Prayoon’s other distinctive feature is the Khao Mo cemetery which is next to the temple’s main entrance. 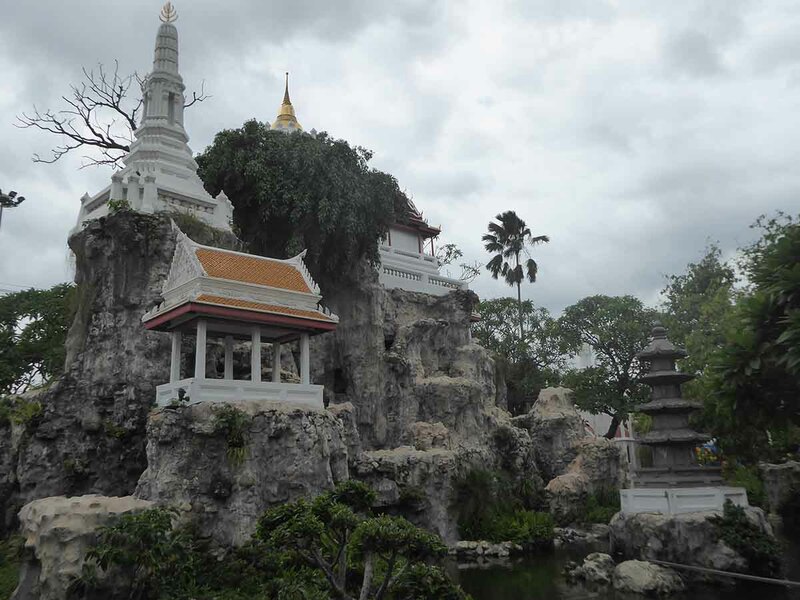 The cemetery features a collection of shrines dedicated to the deceased and a replica mountain modeled after a mound of melted candle wax set in a rock garden, surrounded by a pond and featuring spirit houses, miniature chedis, stupas, cathedrals, pavilions, a dolls house, a grotto, and rare plants. The mountain was built by piling rocks and stones on top of each other. 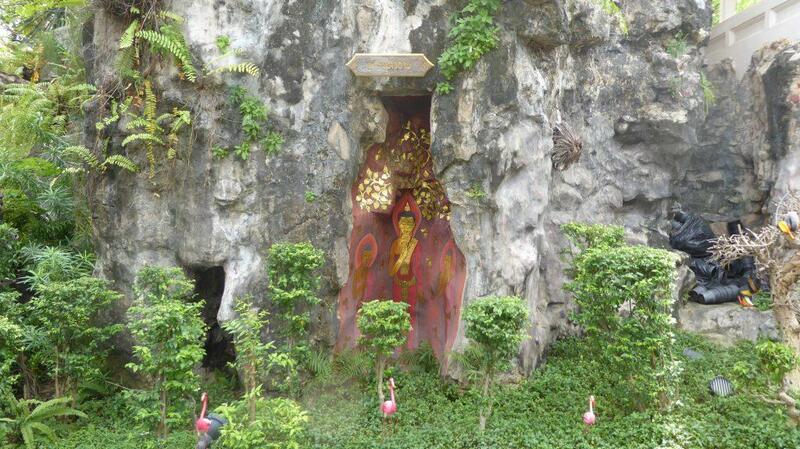 A cave in the mountain houses a reclining Buddha image. 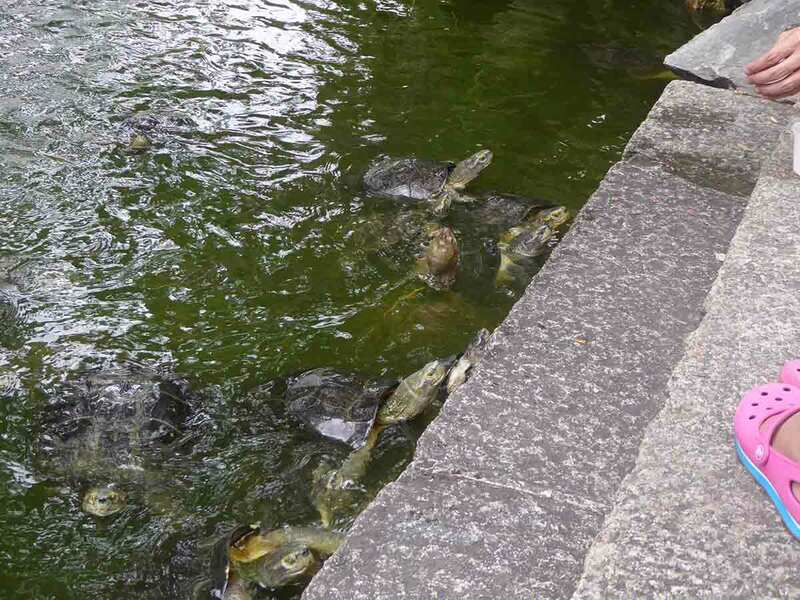 At the edge of the pond is a gothic style Mondop which was built in 1885 during the reign of King Rama V. It was designed and built by European architects the Grassi brothers who also built Bang Pa-In Palace & Buraphiphirom Palace. 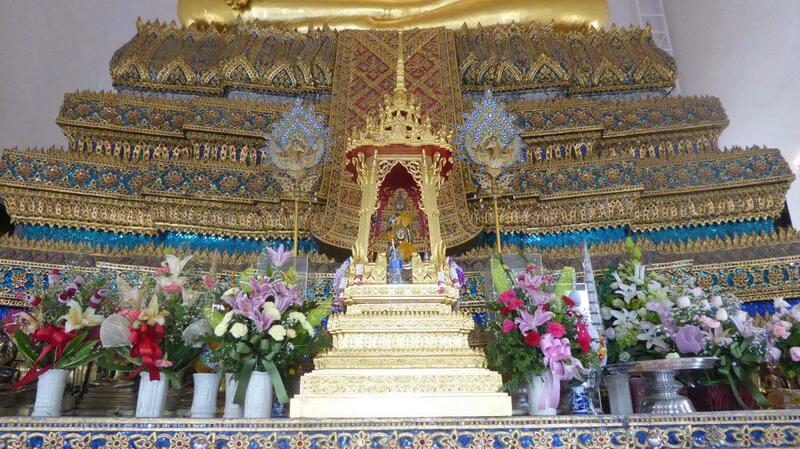 Luang Pho Kaek, one of Wat Prayoon’s most revered Buddha images is enshrined within the Mondop. 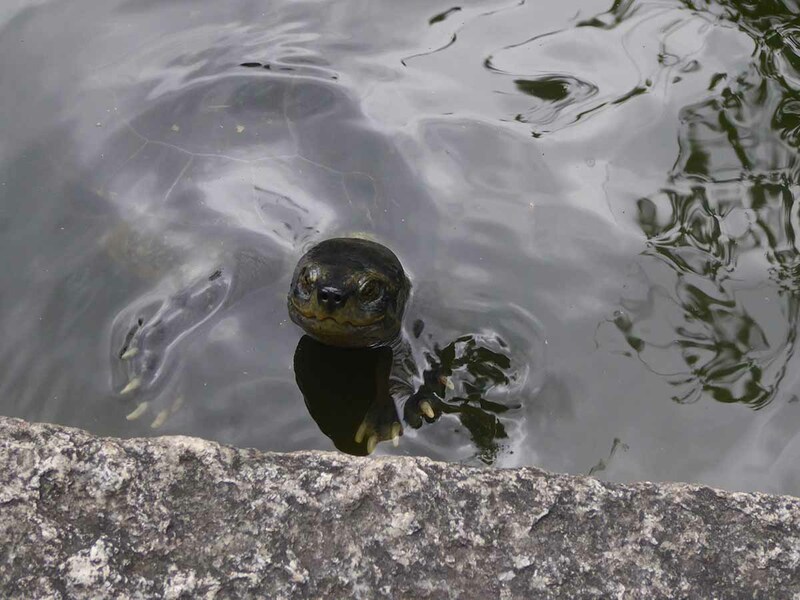 It’s a peaceful, tranquil place containing benches where you can rest awhile admiring the mountain or feeding the resident turtles and fish who inhabit the pond. 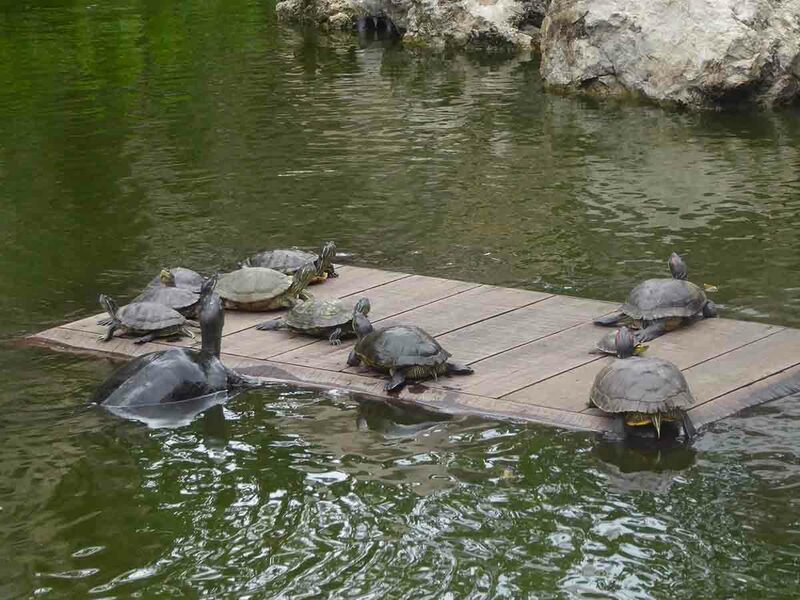 A small stall sells bread, papaya, and other fruit for 20 baht a bag which you can feed the turtles using a small stick. 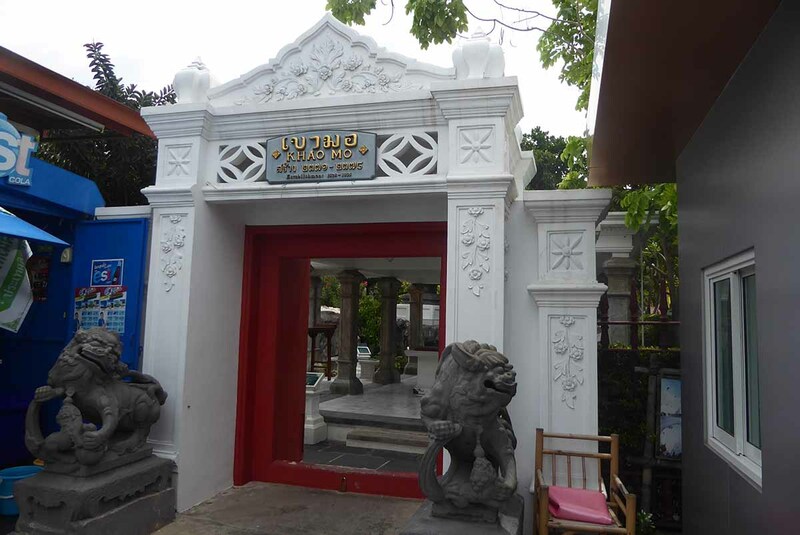 After leaving Wat Prayoon, turn left to the river underneath the memorial bridge and turn left again along a riverside walkway which leads to Santa Cruz church and further on to Wat Kalayanamit which are both worth a visit. How to get there: Take the Chao Phraya river boat to Memorial Bridge pier. Then walk or take a taxi across the bridge. The temple is on the right just after crossing the bridge.